The image is a Laser Print of a pen and ink drawing on coquille paper, producing halftone effects. It is printed with archival ink on heavy-duty matte paper. 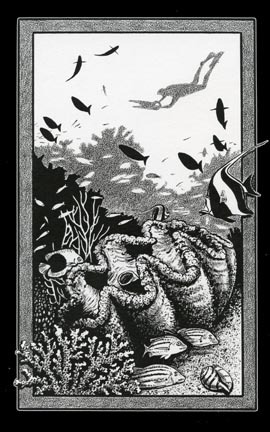 This was one of many black and white illustrations I did for Steve Arrington’s book series called “High on Adventure.” Here is Steve, exploring the coral realms of Davey Jones Locker.